Happy Easter one and all! For the whole of Easter week I will be writing about the most lauded of spring flowers, the daffodil. Spring is dragging its feet, which means many daffodils are still in fine form the festivities. Mine (pictured above) have survived a week of rain and high winds, looking much fresher and brighter than I do. 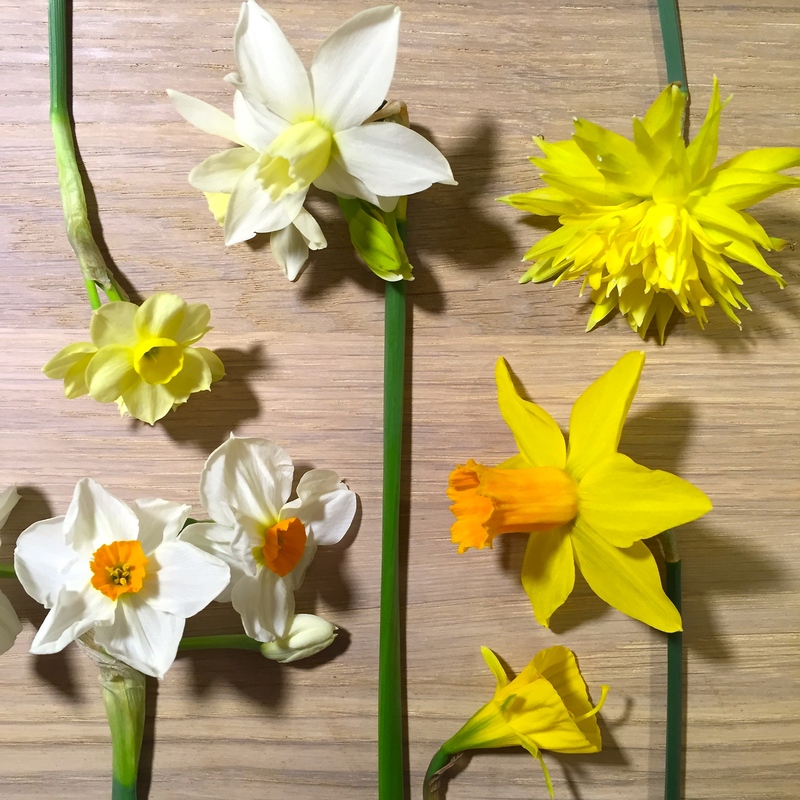 Let me introduce you, from left to right, to Narcissus ‘Rip Van Winkle’, N. ‘Toto’ AGM, N. ‘Minnow’, N. ‘Jetfire’, N. ‘Cragford’ and N. ‘Oxford Gold’, representing a broad spectrum of the smaller cultivars available to gardeners. In our coastal garden, we grow daffodils in pots, mainly from fresh bulbs each season. I have found that N. ‘Jetfire’ and N. ‘Tete-a-Tete’ come back reliably year after year if replanted in fresh compost in August. Others tend to fade away and would be better planted in the ground to bulk up again. I always choose smaller varieties that will not be toppled by the gales but bounce playfully in a stiff breeze. By the front door, strongly perfumed varieties such as N. ‘Chagford’ are a must. In our London garden we should grow more daffodils, but they don’t appreciate the heavy shade in some corners of the plot. I have had greatest success with N. ‘Jack Snipe’, which is a trouper, and N. ‘W.P. Milner’, but I need to plant lots more bulbs next year to achieve the tapestry of colour I am hankering after. 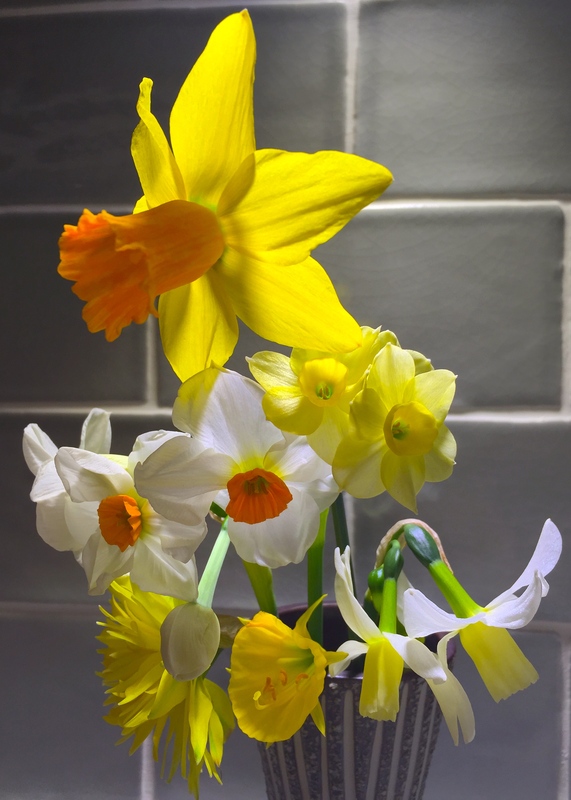 Over the coming week I’d love to hear about your favourite daffodils, tips for putting on a great spring display, and any folklore surrounding these symbolic Easter flowers. Wishing you all a peaceful and relaxing weekend, accompanied by good gardening weather. Happy Easter to you and yours. 🙂 I’m going to have to go out and buy some daffodils today as I await the snow flurries predicted for the weekend but you keep posting photos because I’m enjoying them. Since my garden is shady, early-bloomers best allow foliage to feed the bulb before the tree canopy blocks sunlight. I adore ‘Campernelle’, an heirloom with windmill like blooms and a sweet fragrance. ‘February Gold’ is anther reliable bloomer for shady gardens, plus a good naturalizer, and its long, slender trumpets give it a distinguished look. Two great suggestions Marian. I shall keep those in mind when I order my bulbs in the summer. Any variety that does well in shade is worth knowing about. Happy Easter!